LEMI-018 vector magnetometer for the precise measurement of Earth's magnetic field and its variations at laboratory and land conditions as well as in geomagnetic observatory is produced on the base of flux-gate sensor, all three components of which are implemented in the same body. It consists of two units - sensor unit with adjustable or suspended support and electronic unit both connected by the cable. The electronic unit allows automated operation - acquisition, processing and storage of data about magnetic field and its variations and their transmission at request to the external user via RS232 interface or by the embedded FLASH card. Built-in GPS receiver provides satellite synchronization of the internal clock and the coordinates of magnetometer location. 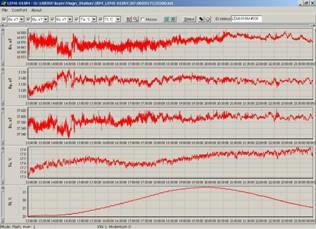 It allows organizing the synchronous operation of a set of the magnetometers installed at the studied area. The considerable volume of internal non-volatile memory for data recording and small power consumption permits to use the magnetometer for long-term autonomous measurements in land conditions. Several sensor options, e.g., tilt compensated sensor, for observatory and laboratory use with leveling facility, hermetically sealed sensor etc. may be selected (in the figure). The program to transfer data into INTERMAGNET format and installation/training service may be offered (optional). The developed magnetometer has numerous know-hows implemented and allows to reach minimal possible sensitivity threshold in comparison with other known competitive versions on the market. Other major advantage is that simultaneously lowest possible consumed power of the magnetometer is provided what makes these devices indispensable for autonomous systems. The magnetometer and sensor have waterproof housings and can operate in wide temperature range autonomously up to 512 days. Serious advantage is also very competitive price – no more than 70% of regular market price for competitive devices. 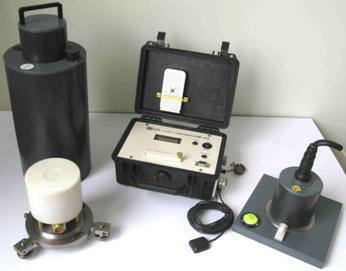 LEMI-018 can be used for magnetic geophysical research in fundamental branch of science and for deposits exploration using the sounding of Earth’s crust in land conditions and in observatories as basic magnetometer as well as for magnetic repeat stations survey. * - other values possible to realize on demand.